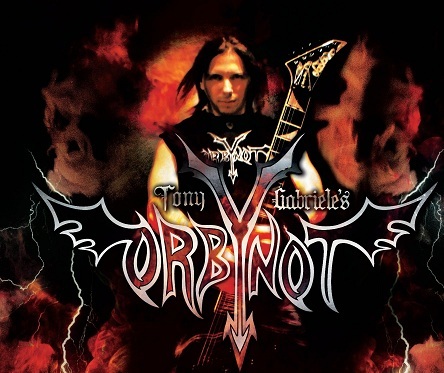 Tony Gabriele’s ORBYNOT (originally called just “TonyBro”) was founded by one person and one person alone, Tony. Always hearing what “is in” and listening to the radio always play the same songs over and over, Tony took it upon himself to follow the saying, “If you want something done, try doing it yourself.” Inspired and driven by Rock and Metal from the 70’s and 80’s, ORBYNOT is a blend of all the bands that have inspired them mixed with a slice of today’s modern style. Originally formed in late 2008 and then put on the shelf 4 months later, due to other members not taking the band seriously, Tony fought hard to keep his dream alive. Once he became the personal student of Metal Mike Chlasciak, Tony is constantly learning from one of the best the Metal world has to offer and his work shows for it!! Teaming up with drummer Metal J from Syracuse NY, they were able to finally put together the Debut Album that is proof of Hard Work, Sacrifice, Patience & Determination! Compiled of 11 Tracks, “Try To Stop Me” consists of Traditional Hard Rock & Heavy Metal that ranges from 4 different Guest Vocalists from across the USA & Canada!! And this is where it All Begins Again!! !